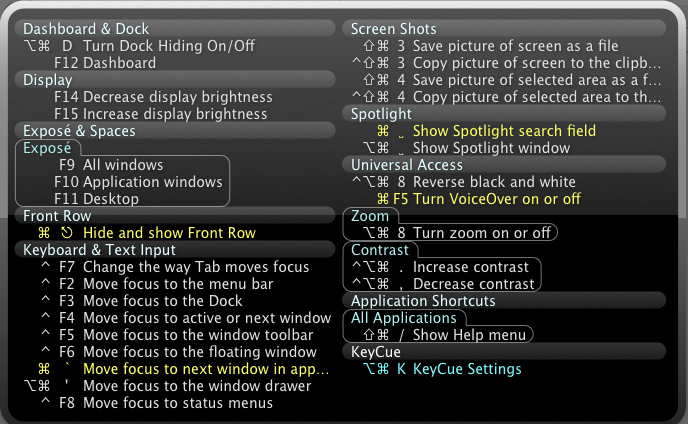 KeyCue lets you view available Command key shortcuts.Simply press and hold the Command key to view a list of all available keyboard shortcuts, making it easy to learn and remember those time-saving keystrokes. Next story PrintLife 2.0.4 – Design with templates and high-res artwork. Previous story Display Maestro 2.0.2 – Optimize resolution and bit depth for attached displays. TG Pro 2.10 – Control fan speeds, monitor temperatures, and find faulty sensors. SimBooster Premium 2.9.5 – System optimizing utility. Mavericks Cache Cleaner 8.0.9 – Clear caches, access hidden OS X settings, and more.